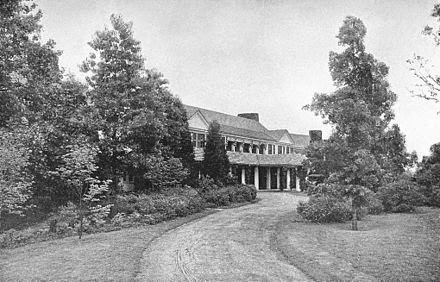 In 1917, Reynolda was seen as an experimental farm to which students of agriculture, dairy production, and animal husbandry in this region would look for the newest and best farming methods. Katharine Smith Reynolds, wife of tobacco king and founder of the R. J. Reynolds Tobacco Company, R.J. Reynolds, was the mastermind behind Reynolda and 98 years ago she invited a group of businessmen and their families from Winston to come out to see the farm, enjoy the fruits of the land and enjoy a traditional backyard BBQ. The meal consisted of pork from the Tamworth hogs raised on the property, grilled vegetables from the garden and local cider, beer and other spirits. Today, the grand bungalow style house and the remaining acreage is Reynolda House Museum of American Art, Reynolda Gardens and Reynolda Village. The museum displays a premiere collection of American art ranging from the colonial period to the present. Today you can reimagine that early 20th century picnic by attending signature Winston-Salem events like Reynolda After Hours, Twin City Ribfest or Texas Pete Culinary Arts Festival where more often than not, barbecue and beer come to meet at the table. Piedmont North Carolina's rich barbecue history is often paired with beer and the conversation often drifts to Winston-Salem where the history of beer began. Long after the English style brewery and beer were made in Salem, Strohs Brewing Company opened a bottling plant here. For 30 years, brands such as Old Milwaukee and Schlitz were made and distributed from Winston-Salem. Today, MillerCoors operates in Eden, NC producing about 9 million barrels of beer a year. Don't forget: you can experience the whole of the beer culture, history and culinary offerings of Winston-Salem when you enter the NC Beer Month Getaway right HERE!